For most businesses, word of mouth is a good thing. And Cima Collina, a young Monterey County winery with a preference for pinot noir, has generated some buzz, said winemaker Annette Hoff. Customers praise its wines to friends, it's on the wine lists of nearly three dozen Monterey County restaurants and in stock at a dozen local wine shops. Customers can buy it online and through wine club memberships. The one thing customers haven't readily been able to do is taste before they buy, and you can't quite taste wine in words. That's why today, the three-year-old winery opens a tasting room in Carmel. The winery, which produces 3,500 cases a year from Monterey County grapes, has offered tasting at its Marina facility by appointment and during special events, but the move to Carmel puts its tasting room doors in the path of thousands of tourists and would-be tasters. "We've had very good success on the wholesale side, selling directly to restaurants," said Hoff, "but we really want the opportunity to sell directly to our customer." Owner Richard Lumpkin had been searching for a retail outlet in a higher-traffic area, and Carmel provided the perfect opportunity with its well-walked sidewalks and multitude of visitors. 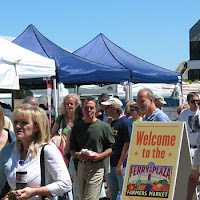 "It's such a pedestrian town," said Hoff, "and I think that's a good combination for wine tasting. Folks don't have to get in their cars and drive." "We looked at a number of different places and this just kind of fit with size and location," said Laura Watson, who handles the wine club and marketing for Cima Collina. The tasting room is approximately 520 square feet, divided into two airy gallery spaces and the tasting area, which features rustic decor and a cherrywood bar hand-carved by a Salinas craftsman. Initially, the tasting room's galleries will feature works by local artists Carol Chapman and Fred Slautterback, with new exhibits every few weeks. But ultimately, the focus of a tasting room is on its wine. And wine is something that Carmel and the surrounding region seems to be taking a greater focus on, with a recent infusion of wine-tasting opportunities. Monterey County winery Galante Vineyards already has a tasting room in Carmel, and several other venues including The Cheese Shop at Carmel Plaza, Southern Lattitudes, Bouchee restaurant's wine bar, offer wine tastings. Another venue, Bubbly Fish, recently opened, offering an indulgent menu of champagne, caviar, chocolate, cheese and cheesecake. "There's kind of a concentration of tasting rooms in Carmel," said Hoff. "I think in the next year or so we're going to see a revolution of wine tasting rooms in Carmel." And in late July, Salinas-based Morgan Winery expects to open a 1,300-square-foot tasting room at the Crossroads Shopping Village, its first after 25 years in operation. Two years ago, Monterey-Salinas Transit introduced the Grapevine Express, a passenger line between downtown Monterey and Carmel Valley's wineries and tasting rooms. Earlier this year, the transit agency expanded the weekend service to daily runs. And this summer, the Carmel Chamber of Commerce plans to release its first-ever wine map featuring both walking and driving wine tours of Carmel and Carmel Valley. "We really believe that'll be an instant hit," said CEO Monta Potter. Rhonda Motil, executive director of the Monterey County Vintners & Growers Association, said new tasting rooms are good news for Monterey County's growing wine industry. Monterey County has 26 tasting rooms, with several new winemakers establishing themselves along the River Road area of Salinas in recent years. Tasting rooms allow small boutique wineries a chance for visibility, said Motil. "We're excited about the addition of Cima Collina in such a famous area as Carmel," she said. "That's where a lot of tourists are going, so we look forward to the opportunity to exposing a greater number of tourists to wines from Monterey County." Tastings rooms are crucial if Monterey wants to compete with other wine regions, Motil said. "The more that we can get in front of the consumer who's visiting from outside our own area, the better, and having a location that's so well-traveled, that's good for all of us," she said. "People can take a bottle back (home), or join a wine club, and they carry that name recognition back home." The parent of Columbia-based U.S. Foodservice said yesterday that the sale of the food distributor remains on track despite the failure of a bond sale intended to help finance the deal. Dutch food company Royal Ahold, which also owns Giant Food, agreed in May to a $7.1 billion deal to sell U.S. Foodservice to private equity firms Clayton, Dubilier & Rice and Kohlberg Kravis Roberts & Co.
On Tuesday, U.S. Foodservice postponed plans to sell $650 million in senior notes because of weak market conditions, an Ahold spokeswoman confirmed yesterday. This came after the deal was restructured several times over the past week, according to research firm KPD Investment Advisors Inc. The original offering was for $1.55 billion - $1 billion in toggle bonds and the remaining $550 million in senior subordinated notes. Toggle bonds allow the issuer to pay interest in additional debt as an alternative to cash. In response to investor pushback and weak market conditions, U.S. Foodservice restructured the deal - trimming the note sale to $450 million and making it a private sale, but increasing the amount of toggle notes to $1.1 billion and making half of those cash-paying. Investors still were not willing to buy, so Ahold restructured the deal again, leaving $650 million of senior notes. "We don't expect any consequences for the transaction," said Caro Bamforth, an Ahold spokesman in the Netherlands. Bamforth wouldn't comment on how the buyers now expect to finance the deal. Deutsche Bank, lead underwriter in the bond deal, also declined to comment. But a person close to the acquisition said the deal is not in jeopardy because it included a contingency for "bridge" financing if debt investors showed no interest in the deal. "It's going to be financed by the banks from this situation," the person said. "When they got into this the banks agreed to do this - to backstop the debt offering." The banks will try to resell the bonds later in the year. The problems financing the U.S. Foodservice deal have raised concerns about sudden weakness in the market for private-equity buyouts. Rising interest rates and underwriters who want better deals have hurt recent buyout plans. "It's a more expensive market," said Bill Schultz, chief investment officer at McQueen, Ball & Associates in Pennsylvania. "That's why you see some of these deals pulled." An Aston Martin used by James Bond in ‘Goldfinger’ will be among the top attractions at this year’s Pebble Beach Concours d’Elegance car show. Fully equipped with famous gadgets — including a revolving number plate and bullet-proof deflector shield — the DB5 is one of several dozen Aston Martins that will be on display at the August 19 car show in northern California. 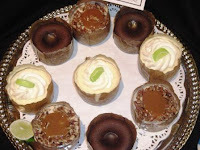 One of the more popular booths at the US Foodservice San Francisco Customer Product Showcase held at the San Ramon Hilton this week was the Devonshire Desserts. 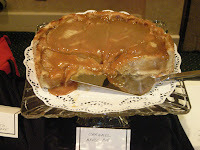 Devonshire Caramel Apple Pie #732222 2/88oz,12 slices approximately $2.60/per portion. Our desserts have a hand-crafted character and leave a fresh, clean taste lingering delectably on your customer's palate. We use only the finest ingredients - premium grade cream cheese, heavy whipped cream, whole eggs, and grade A butter, with no preservatives. Cheesecake sell more than any other dessert. It represents 18% of the dessert market share. Every product you select from our extensive line of cheesecakes, specialty cakes, gourmet pies, tarts, dessert bars and other signature desserts, delivers the sensory satisfaction that will keep your customers coming back for more. 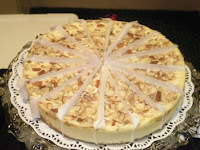 Introducing Devonshire's newest product, the Amaretto Almond Cheesecake. A great combination of amaretto flavoring and almonds added to our New York style cheesecake and placed on a graham cracker crust 2/64 oz. 16 slices each, at approximately $1.30/portion. USPN # 755249. Research shows that profits can increase by 18% on average as a result of "on premise" merchandising. As an added benefit of using Devonshire products on your menu, you have access to menu assesments, printable merchandising pos, and more. 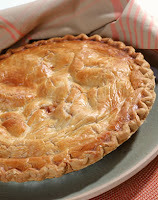 Please browse WWW.Menuinspirations.com . 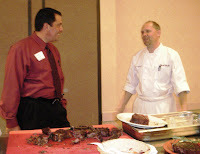 Menu assesments for Hors D'oeuvres also available. For information about how to purchase these product lines and maximize your dessert catagory please contact Brian @ Brian.Isaeff@gmail.com . People looking for another reason to buy organic milk besides the health and environmental benefits may get one they never anticipated - price. With costs surging for conventional milk, consumers this summer will find prices for the two types of milk getting closer and closer, as opposed to when once organic milk could cost three or four times as much. Conventional milk prices are getting pushed up by a variety of factors - Australian drought, disappearing European subsidies, higher feed costs due to corn-based ethanol production and swelling global demand chief among them. At the same time, organic prices have stabilized and in some cases dropped due to what experts call a one-year glut in production caused by farmers taking advantage of a regulatory grace period regarding feed requirements. Hundreds of new farms are going organic, creating an abundance of milk that has even led to a price war of sorts in some parts. The increased competitiveness and dynamics of the milk market have some organic producers salivating at an opportunity for growth and others lamenting the bottom-line results of a cut-rate market. "People do trade up," said Theresa Marquez, chief marketing executive for LaFarge, Wis.-based Organic Valley Family of Farms, the nation's largest organic farmers cooperative. "That will increase demand for organic. We are seeing a pretty robust demand and continued growth for organic milk right now." The $14 billion organic foods industry has been growing rapidly over the past five years, with dairy accounting for some $2.14 billion in sales. It's milk, though, that is expected to see the biggest surge in 2007, due primarily to the Department of Agriculture giving farmers one last year to feed cows 80 percent organic feed and 20 percent conventional to be certified as organic. 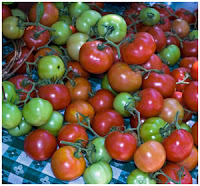 Starting next year, farms will have to go 100 percent organic. That extra year provides farmers a substantial savings, leading many to join the organic bandwagon this year in hopes of cashing in. The resulting growth in milk supply has been the leading market dynamic this year, with organic giant Dean Foods, owner of Horizon Organic products and Silk soy milk, revising its earnings forecast downwards because of what it cited as "a significant near-term industry-wide oversupply of raw organic milk." Ed Maltby, executive director of the Northeast Organic Dairy Producers Alliance, predicts a 70 percent increase in organic milk supply in 2007 before returning next year to the traditional 20 percent or so growth. The resulting glut this year has caused some interesting scenarios on supermarket shelves, Maltby said. In some areas, organic milk can be had at a price of $5 for two half-gallons, about 30 percent off the typical price. "From the point of view of the consumer, it's the larger brands that are looking to maintain their market share" that are cutting prices, he said. "We're hoping that will increase consumers' consumption of organic milk, because it is produced in a way that benefits the environment." For its part, Dean Foods indicated in its earnings guidance that it will do what it must to protect market share. "This program includes lowering prices in response to competitor actions, pursuing expanded distribution, increasing our advertising support and continuing to drive innovation to maximize the long-term potential of the brand," Dean Chairman and CEO Gregg Engles said in a statement. After years of languishing under government controls, pricing has become a sensitive subject in the dairy community. Many farmers have been looking forward to this year's price surge, in which a gallon of conventional milk is running at $3.38 nationally and expected to hit $4 or more in the coming months. Dairy farmers suffered during last year's drought and are hoping to recoup their losses this year. As such, undercutting prices at a time of burgeoning supply and increased public demand is creating a bit of a stir in the organic market, in which prices can vary greatly from market to market depending on feed costs. Organic Valley milk, for instance, can run anywhere from $3.29 to $3.99 a half-gallon and up to $5.99 a gallon, while other organic milk can go as low as $3.99 a gallon. Organic Valley's Marquez took the pricing statement from competitor Dean Foods as a warning to her company. But she said the co-op hasn't done anything unusual this year in terms of promotions. "We believe in sustainable pricing in the agricultural community," she said. "We will not low-ball our milk. We'll probably lose customers before we go into a price war." With 95 percent of its retail space leased, the biggest shopping center under construction in Monterey County is primed to transform the landscape for area shoppers - and competing businesses. National chain stores will fill most of the 365,000-square-foot center going up at the former Fort Ord in Marina, project officials said Wednesday. The center is part of The Dunes on Monterey Bay, known as University Village until last week, when developers announced a name change. The change was an internal decision that won't affect the development's components, a spokesman said. The first buildings of the shopping center have already gone up at Imjin Parkway and Second Avenue alongside coastal Highway 1. They're the first elements of the planned 429-acre residential and commercial Dunes development between downtown Marina and California State University, Monterey Bay. Stores will begin to open in October, with Target and Kohl's among the first to welcome shoppers, said Bob Schaffer, spokesman for Marina Community Partners. The partnership includes developers Shea Properties, Shea Homes and Centex Homes, and the city of Marina Redevelopment Agency. Other stores that will open in the center are Best Buy, Old Navy, outdoor gear dealer REI, a Michael's craft store and Bed Bath & Beyond. "We're happy to be at this point," Shaffer said. "When we began, we were unsure about interest in the retail space, but we're certainly pleased with the response we've gotten." Groundbreaking of the retail center took place in January on the site that once housed crumbling roads and sagging military buildings. Full occupancy for the stores is expected in early 2008, project officials said. Over eight years, developers plan to build more than 1,230 housing units throughout The Dunes project, 30 percent of which will be affordable. The Dunes will also include two hotels and a 700,000-square-foot business park. Another component is the planned Tenth Street mixed-use district, anchored by a 12-screen cinema, restaurants and shops with more than 30 housing units above the retail businesses. Developers are pursuing both local and national tenants for the area, Schaffer said, which will see a groundbreaking likely in mid-2008. A boardwalk will link both districts to the beach across Highway 1, parks and the greater community. Construction on The Dunes' residential units is expected to begin in October, officials said. At Wing Stop, a chicken-wing restaurant newly opened in northeast Salinas, almost all of the franchise owner's family members are involved in the production and management of the dine-in/take-out eatery - including 12-year-old Kalanni Young. Kalanni, daughter of Wing Stop co-owners and Salinas residents Willie and Claudia Young, started helping out by cleaning tables when the restaurant opened about six weeks ago. Then she took orders from guests for a brief period. Now, Kalanni is out in the field with her grandmother handing out flyers to area residents. "Luckily, all our siblings live in town and we can rely on them for support," said General Manager Yolanda Pena, Claudia Young's sister. Pena said at least one family member is in Wing Stop at all times. Wing Stop is in the Creek Bridge Shopping Center on Constitution Boulevard at Manchester Drive. The restaurant's grand opening will be held sometime in the next two weeks, Willie Young said. The family had a dream of opening a chicken-wing-style restaurant, Pena said, and decided to buy a franchise from Wing Stop Restaurants Inc., based in Richardson, Texas. "We decided it would be better than a mom-and-pop-type restaurant," Pena said. "If a Wing Stop came into town, it could have blown us out of the water." The Salinas Wing Stop has had a successful opening, pulling in more than the average Wing Stop restaurant in its opening weeks, Pena said. "I knew some people would like it, but I didn't expect it to be as popular as it is," Willie Young said. Young said there is a niche for wing-style restaurants. 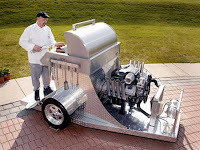 He is considering opening another store in Gilroy or Monterey. "It's different. It's not the normal," Young said. "There isn't anyone in Salinas that doesn't like chicken." The restaurant features nine different hot-wing flavors, including the two most popular - lemon pepper and garlic parmesan. All food is cooked fresh when ordered, Pena said. Customers can call in orders. Catering is available. According to the Wing Stop Web site, 109 stores are to open in California by 2009. Here is a handy feature for customers purchasing from US Foodservice San Francisco. These forms are available on a CD and ready to load onto your computer. ConAgra Foods brand Hebrew National has introduced Jumbo Beef Franks, which promise the same taste as a regular Hebrew National frank at nearly twice the size. To help promote the new offering, Hebrew National is encouraging consumers to "Raise Your Hot Dog Inner Quality" at HebrewNational.com. The online quiz aims to educate consumers about the brand's kosher beef franks and the kosher production process. According to a poll of 500 working mothers conducted by Ketchum Public Relations and M/A/R/C Research for Hebrew National, almost half of moms (49 percent) are unsure of what's inside a hot dog. When asked about the contents, moms surveyed suspected fillers (80 percent), by-products (76 percent), artificial flavors (66 percent), artificial colors (64 percent) and low-quality beef (63 percent). Hebrew National is proud to announce that all its products are now under the kosher supervision of the internationally recognized Triangle organization. You’ve heard the word kosher, but did you know that it literally means “fit to eat”? 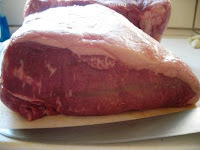 Hebrew National must follow strict biblical dietary laws, use only certain cuts of beef, and meet the highest standards for quality, cleanliness, and safety. For over 100 years, our commitment to manufacturing products of only the highest quality has meant that artificial preservatives, flavors, colors, and by-products are simply not allowed. Kosher also stands for quality and goodness, and that’s why we believe our franks have premium taste. Kosher means "proper," referring to foods which are acceptable to be eaten by those of the Jewish faith who practice and observe certain dietary laws as prescribed in the Torah, the Bible. Such foods and food product derivatives are said to fall under the laws of kashruth. These laws come primarily from the Bible, with additional Rabbinical decrees which have been handed down through generations of time. In order for the Triangle to be affixed to any product, rabbinical supervision of the food preparation process is required. This includes examination of ingredients, as well as processing and packaging equipment. The Triangle symbol is a trademarked logo that signifies "kashruth" (kosher) as defined by the most stringent Jews who follow Orthodox Jewish Law. Kosher certification with the Triangle means that a product is certified kosher and recognized as such. The organization offers it's rabbinical supervision and certification on any ingredient or product that meets the strictest criteria of what makes such items kosher. Triangle is a symbol of integrity representing the most trusted and reliable name in strict rabbinical food certification and supervision. For over a half century, Triangle has been committed to making kosher food products available to people around the world in the widest variety of food products. Rabbi Ralbag, Head Kashruth Administrator (kosher supervisor) of the Triangle organization, was born in the Holy City of Jerusalem. He studied at the Yeshivahs Etz Chayim and Merkaz Harav in Jerusalem . He received Semicha (rabbinical ordination) with the highest honors, Yore Yore Yodin Yodin, by the most pious Rabbis of the Holy Land , Rabbi Iser Zalman Meltzer - Rosh Yeshivah of Yeshivahs Etz Chaim, Rabbi Yacov Moshe Charlap - Rosh Yeshivah of Merkaz Harav, and Rabbi Hirsh Pesach Frank - Chief Rabbi of Jerusalem and others. Rabbi Ralbag is presently the Rov (head rabbi) of Congregation Bnai Israel in New York City, a strictly Orthodox Kehila (community). An accomplished writer, Rabbi Ralbag is the author of the Sefer Imre Yehosef, a scholarly book on Halacha (Jewish law), and has also contributed numerous Torah articles to the American Rabbinical Journals, HaPardes and HaMaor, and to the Jerusalem Torah Journal, Kol Torah. In addition, Rabbi Ralbag is the Kashruth Consultant of the National Magazine, "The Synagogue Light" and is an executive member of the Union of Orthodox Rabbis of the United States and Canada, Agudas HaRabonim. While there may be slight variations from plant to plant, the requirements for the manufacture of all kosher food are based on the same fundamental principle of Jewish Dietary Laws: only kosher ingredients processed in kosher equipment. Any manufacturer of food or food products within the boundaries of the Dietary Laws can apply for kosher certification. The first step is the investigation of the plant and its procedures, as well as the ingredients, equipment, and processes used in the production of the product. This investigation is conducted by a special supervisor, the mashgiach, or an ordained Orthodox rabbi. If the ingredients have already been certified as kosher, the mashgiach may still have to inspect the manufacturer's plant. In some cases, the certifying service may recommend changes in a product's ingredients; in other cases, it may recommend structural changes in the plant. If the preliminary investigation indicates that the ingredients and procedures are acceptable, the manufacturer is informed as to the nature of rabbinical supervision required for the food product for a specific period of time. 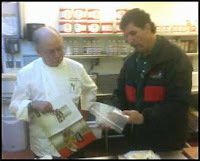 Each individual food product must be inspected and certified separately, and the certification process is ongoing; each product must be inspected every year. The projected relationship between the manufacturer and the rabbinic organization granting supervision and certification is formalized in a written agreement. The use of chemicals and food additives has made it increasingly difficult to determine the kashruth status of a product. This has resulted in stringent supervision and inspection of all ingredients and equipment used for the preparation of any one food product. These standards are so exacting that an entire formula can be prohibited if the supervising rabbi finds in it even a single non-kosher ingredient that makes up only one-tenth of one percent of the total. In an effort to protect kosher-observant consumers, kosher laws have been incorporated into various state codes. In New York the Kosher Law Enforcement Division (KLED) is maintained to aid its large Jewish population and protect consumers from the mislabeling and misrepresentation of food products. 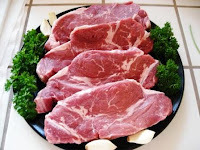 A division of the state's Department of Agriculture and Markets, KLED's tasks include ensuring that business selling any item with kosher certification - particularly meat and poultry products - adhere to the state's labeling laws. Stated Rabbi Rubin, "We feel the consumer is to be protected. 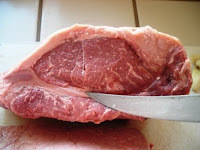 If a market section says it is kosher, it should be kosher without the buyer having to carefully check the ingredients." The legal protection for kosher consumers was first introduced into American law in 1915. 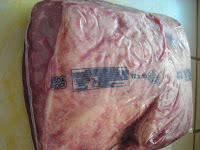 According to Kashrus, "New York has continued its leadership role by setting standards for the development of new ways to guard against fraud and misrepresentation in the sales and distribution of kosher food" KLED laws require that meat and meat parts (including poultry) be identified as kosher through the use of tags and plumbas. The regulations also address the procedures to be followed with respect to the required washing of meat and the method of transportation. I like sizzling meat on the grill. Wild, huh? Anybody? 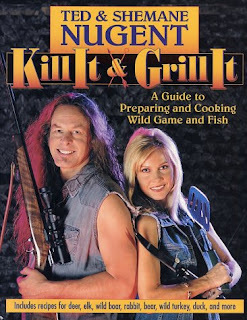 Now, we all know ol' Nuge isn't by any stretch of the imagination a weirdo when it comes to an omnivorous diet. 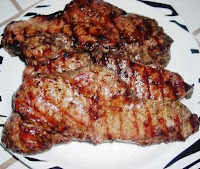 Especially here in the great Republic of Texas, a smiling, drooling preference for succulent, protein-rich, nutritious backstrap over aromatic mesquite coals is as American and natural and right as Mom, apple pie and the flag. It's beautiful, really. You heard that right. Fired for eating meat by an animal-rights maniac, hard-core vegan bass player. The entire agenda of the gazillion-dollar-financed joke known as PETA literally is dedicated to outlawing meat. Neither I, nor any hunter or meat eater on the planet, has any desire whatsoever to influence any vegetarian's choice of diet or to force them to eat meat. We are the friendly, tolerant Americans. This is but one of many issues that represent the line drawn in the sand between liberals and conservatives. Our own intrepid opinion editor at the Trib, my friend John Young, doesn't want to simply make the choice to be unarmed and helpless for himself. He has again recently insisted that you and I must also comply with his soulless condition of unarmed helplessness in "gun-free zones." Nobody from our side wants to force anybody to have a gun or defend themselves. It is us, the conservatives, who are for individual choice. As for the American left: One hears the words of Mao Tse-Tung come broiling out of the mouths of its heroes, when Ted Kennedy and Hillary Clinton et al unflinchingly push for "redistribution of wealth." Central Texas' own Chet Edwards has the audacity to support taxing the after-tax life savings of American families following the death of a loved one. The unfair, un-American, unconstitutional death tax literally destroys mom-and-pop businesses across the land. Think about it. Recently, Danny Glover, an otherwise fine actor, embarrassingly abused his uniquely American freedoms by siding with the communist Venezuelan dictator Hugo Chavez to finance what clearly appears to be an anti-American propaganda film. Nice. Meanwhile, right there in that communist country, old Hugo is shutting down an entire media network for daring to challenge his heavy handed, corrupt, dictatorial policies. This is a leader who has proudly sided with terrorist support groups, and Danny Glover gives him a big hug. If a Venezuelan citizen were to do so with President Bush, I am confident that Chavez would not respect that individual's right to free expression. Venezuela gives its citizens no right to free expression. Glover must be blinded by the trees in that forest. Examine the agendas of the liberal "party of peace." Its members clearly don't believe you and I are smart enough or capable of making our own choices in life. While conservatives "live and let live," the left arrogantly thinks it knows better than we do and will burden "we the people" with more government control until we are taxed to death. Watch them. Listen, pay attention and blow whistles. Educate your family, neighbors, friends, co-workers and hunting buddies on how dangerous such control is against the American Dream of individual pursuit of happiness. Throw off the shackles of government-run slavery. Stand up for individual independence. Enough is enough. Hey, Hugo and Hillary, leave me alone. Camp is right around the corner. Madi, my girl scout had a camp prep weekend, the last weekend as a matter of fact, before her real camp starts. Saturday morning we drove up to Aptos and I dropped her off. I detoured on my way back into town by the Gizdich Ranch to check out their self pick program, or as they call it the "Pik-Yor-Sef". Gizdich Ranch was originally purchased by Vincent John Gizdich, a Croation Immigrant, in the 1930's. 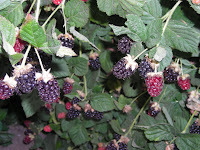 In 1950 Mr. Gizdich and his son Vincent Jr. leased extra acreage to experiment with the new Olallie berry, which is a cross between a Black, Logan, and Young berry from Cornvallis Oregon. Vince Jr. took over full management of the farm in 1959. The ranch was now 30 acres of apples and berries. 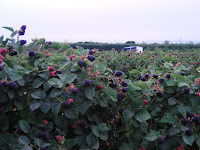 Another 20 acres was devoted to Olallies Berries. The "Pik-Yor-Self" operation was established in 1965 and apples were sold for the first time on the ranch site. The big red barn that is their major symbol was built in 1974. In 1980 The Eata Nita Pie Shop was opened. Today 16 varieties area baked. 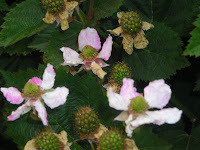 I started off in the strawberry fields picking berries, and then moved over to the Olallie fields. 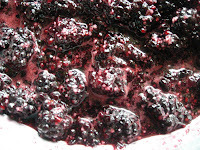 My final harvest was 2 1/2 pounds strawberries, and 4 1/2 pounds Olallieberries. 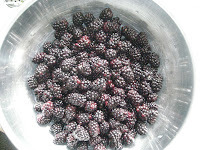 By 8:00pm we had 2 pies and a few berries left. 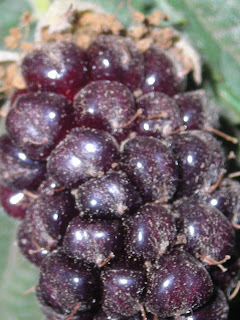 Gizdich is definately worth a return trip, and after all..these raspberries won't be ready until July. LESLIE, Mich. (AP) - A man widely believed to be the model for the smiling chef on Cream of Wheat boxes finally has a grave marker bearing his name. "Everybody deserves a headstone," Lasorda told the Lansing State Journal. He discovered that White was born about 1867 in Barbados, came to the U.S. in 1875 and became a citizen in 1890. When White died Feb. 15, 1938, the Leslie Local-Republican described him as a "famous chef" who "posed for an advertisement of a well-known breakfast food." White lived in Leslie for about the last 20 years of his life, and the story of his posing for the Cream of Wheat picture was known in the city of 2,000 located between Jackson and Lansing and about 70 miles west of Detroit. The chef was photographed about 1900 while working in a Chicago restaurant. His name was not recorded. White was a chef, traveled a lot, was about the right age and told neighbors that he was the Cream of Wheat model, the Jackson Citizen Patriot said. 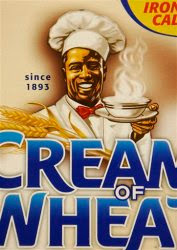 Long owned by Kraft Foods Inc., the Cream of Wheat brand was sold this year to B&G Foods Inc. It's been in the news quite a bit in recent weeks: Much of imported farmed seafood is unsafe. And, the skyrocketing demand for fresh seafood has pushed many wild fisheries into crisis mode. And that's especially true for salmon. As he answered my questions, we walked by recent displays in the aquarium, including the "Real Cost Cafe," where a video of a chef, a waitress and waiter talk to you if you order, say, tilapia. Chef: "Goodbye, my beautiful little tilapia." Waiter: "Excellent choice. So tender. ... And tilapia's a hardy freshwater fish ... you don't have to catch more fish to feed them. Tilapia are fed a vegetarian diet." 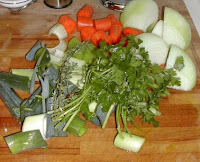 In another segment, the chef begins, "Uch. Who ordered the farmed salmon?" The farmed salmon situation has always been particularly challenging. Almost all farmed salmon are raised in offshore open net pens, where concentrated waste decimates the ecology of the coast. These confined and bred salmon, which come from a tiny genetic pool, can escape and breed with local species, and throw off the wild breed's ability to reproduce. Cramped pens necessitate the use of antibiotics. Red dye is fed to the fish to give the meat an appealing color. All of these are reasons that salmon farming has been considered unsustainable. Yet, the demand for salmon -- in the United States, it's the second most popular seafood after shrimp -- continues to escalate. The bottom line, according to Seafood Watch, is that salmon should be the rare treat, "Something you eat for weddings and funerals," says George Leonard, a senior analyst at the aquarium. Salmon are carnivores. Salmon farmers harvest natural wild fish to feed their caged fish. Unlike any animal that we have domesticated for consumption in human history -- think cows, pigs and chickens -- the farming of salmon means raising meat by feeding it meat. It takes 2 to 10 pounds of small fish caught wild in the ocean to raise 1 1/2 pounds of farmed salmon meat, according to MBA's calculations. The farmed salmon industry figures it's 1-to-1, still a wasteful ratio if you consider time, labor, land and transportation. There's a net loss of protein every time you eat a piece of farmed salmon. It takes away food from the wild fish trying to survive in the ocean. As far as I know, we have never raised the likes of tigers, lions and panthers -- carnivores all -- in order to eat them. That would have required so much food that we would've run out of animal protein long ago. A few so-called "boutique" salmon farms in Europe claim to raise the fish sustainably. Those include Loch Duart salmon from Scotland, which is served at restaurants such as Aqua and Boulevard in San Francisco. "Loch Duart salmon live a robust life, have plenty of room to grow, and is fed from sustainable sources that mimic the natural diet of the wild," says CleanFish, a sustainable fish wholesaler in San Francisco, on its Web site. 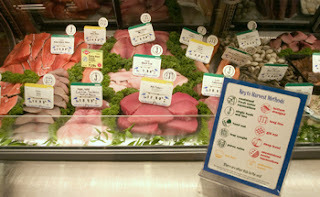 CleanFish also markets wild-caught Alaskan salmon and a few other sustainably wild-caught fish. Loch Duart does not raise fish in high-density pens, allows areas to lie fallow in alternate years and does not use antibiotics, the company says. Yet Monterey Bay Aquarium, as a conservancy organization, draws lines where conscientious fish sellers don't. According to MBA's Seafood Watch criteria, the farming methods and the feed situation of the boutique farms are no different than other high-density farms. Seafood Watch puts all farm-raised salmon in the "avoid" category. "They may be a different shade of red, but they're still in red," Peet says, referring to the Seafood Watch program's ratings: red (avoid); yellow (good alternative); green (best choice). However, some question the ratings. While farmed clams, mussels and oysters are designated "best choice," for example, no differentiation is made between regionally raised shellfish and oysters flown in from France and Australia, which cost much more in dollars and energy. Peet says he hopes the Seafood Watch list will soon factor in transportation as a criterion for sustainability. In the meantime, the National Oceanic and Atmospheric Administration, under the Department of Commerce, is behind the 2007 National Offshore Aquaculture Act (HR 2010). Although environmental checks are included in the proposed bill, it contains provisions to encourage and develop offshore aquaculture to offset the $8 billion seafood trade deficit, which includes a large percentage of foreign aquacultured seafood. 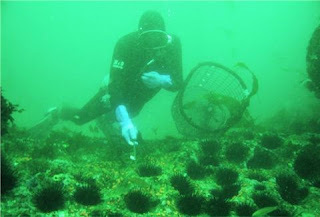 Conservancy organizations such as MBA fear that NOAA is rushing ahead without enough taking enough precautions to make sure that offshore farms raising carnivorous fish such as tuna, cod and halibut do not dot our shorelines, damage ecology and deplete the oceans of wild fish. "It's a real Catch-22,'' Peet says. To pay for building new offshore facilities, aquaculture entrepreneurs, some of whom are former salmon ranchers, are looking at farming the high-priced carnivorous species, such as tuna, which can require from 10 to 25 pounds of wild-caught small fish to produce 1 pound of edible meat. The problem, he says, is that the perfect fish for farming has yet to be found. "We need more aquaculture because to meet global seafood supplies, and it needs to be species that are farmed in sustainable ways." The rush to put offshore carnivorous fish ranches in should be avoided, he says. "It's better to be precautionary." While China's ancient tradition of diversified aquaculture and reliance on herbivorous fish is a good model, it is, ironically, the country's industrialized aquaculture that now proves unsustainable or unsafe. "Most of what we eat that's farmed is coming from China. We have little idea of what's happening in China," said Peet. Food and Water Watch reports that the United States imports 80 percent of the seafood we consume, most of it from Latin America and Asia. The aquaculture practices in many of these countries damage the environment, and many enterprises use additives and antibiotics banned in the United States. Peet was born and bred on Vancouver Island, Canada, and earned a master's degree in marine conservation ecology from the University of Victoria. He has watched what he says is the selling out of the Canadian Pacific coast by the Canadian government, which emphasized economic sustainability ahead of ecological sustainability. As a result, the local wild salmon population is now stressed by diseases carried by the farmed fish from Canadian offshore salmon ranches, he says. Aquaculture in the New World is a new frontier. "There's mass confusion out there," he says. Good sustainable models, changes in consumer preference, new technology, new certifiers and international regulation of aquaculture -- in other words, a new infrastructure -- must be put in place. The good news is that several entrepreneurs are experimenting with more sustainable closed aquaculture systems and other methods that integrate fish-farming with a diverse system of crops and livestock. We still have a chance to get it right, he says. "Aquaculture has to play a role -- or we don't eat fish." Which farmed fish are sustainable? According to Monterey Bay Aquarium's Seafood Watch, five of the 10 most popular types of seafood in the United States are farmed. Here are the aquarium's sustainability ratings for farmed fish: Seafood designated as "good" and "best" are raised by more environmentally sustainable methods, including proceses that use closed recirculating systems and enclosed ponds. Seafood designated "avoid" generally are raised in open net pens that can impact the environment more severely. Closed system: Recirculating systems enclose fish in tanks, where water is treated and recirculated through the system. Almost any finfish species such as striped bass, salmon and sturgeon, can be raised in recirculating systems. Open system: Open net pens and cages enclose fish in offshore coastal areas or freshwater lakes. This system is generally used for salmon and tuna. Fish and waste can escape into the wild, which is a drawback of this system.